In South Asia, the existing Cross-Border Electricity Trade between India and its neighbours namely Bhutan, Bangladesh and Nepal, provides a foundation for furthering this cooperation at the regional level. The existing electricity trade agreements are bilateral in nature and have benefited the participating nations. The ongoing projects to set up more cross-border interconnections between Bangladesh and India, and discussions on sea links between India and Sri Lanka, reveal the potential for regional power sector cooperation. Building on the experience of bilateral electricity trade in the region, a multilateral framework for power sector cooperation can be developed. Regional electricity cooperation may include the sharing of cross-border infrastructure, establishing regional power producers, and enhancing competition across regional markets. This would require, among others, investment in new border interconnections and the development of harmonized codes, policies, and regulations for the overall growth of the power sector. 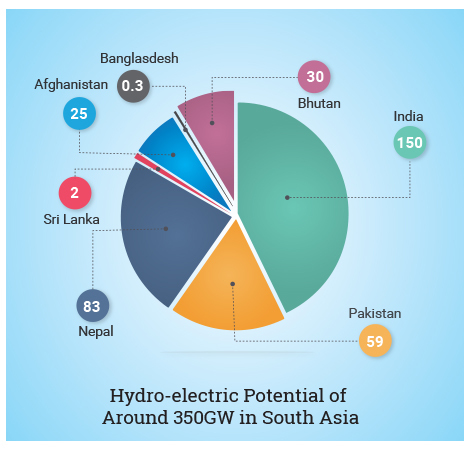 Given the significant potential of hydro-electricity generation potential in South Asia it is expected that this would play a major role in any future strategy for regional power sector cooperation.